Economic indicators tell us about the state of a market in the form of statistics. Analyzing economic indicators can help us predict future performance. Some common economic indicators include indices such as GDP, unemployment rate, industrial production, stock market and money supply. When a market follows a trend, this is most likely shown by certain associated economic indicators that shape the market. Trends are important because they offer unique opportunities for profits. Let’s look at some of the major factors influencing market trends. The government is where all trends start, and in case of an overly regulatory government, this is also where most trends end. A government’s fiscal and monetary policies are most important in terms of their financial impact on the market. Governments usually announce such changes and the news influences traders and investors. Any increase or decrease in government spending has a direct impact on unemployment and price stability. Any change in interest rates and the amount of currency available in the open market will change the amount of investment coming into or going out of a country. Similarly, government monetary policies can increase or decrease the growth of a country’s economy by hiking or cutting interest rates and the reserves held. Lower interest and tax rates encourage spending, while higher rates impede selling and result in a contraction of market prices. The flow of goods and money between countries reflects on a country’s economic strength and the strength of its currency. Put very simply, more money going out of the country weakens the country’s currency and economy. Therefore, countries with strong export of goods and services are able to pull money into their economies that can be invested to simulate financial markets. The balance of payments between countries is not easy to track in the short-term, but their long-term effects are usually visible. Ongoing currency rates offer an easy indication of how the economy compares to others. The value of a currency decides how business is conducted internationally. Weak currency exchange rates can make investors lose interest, as the lower values will eat into any profits earned. Trade and investment react to government policies and the state of international exchange of goods and finances. The market speculates about which direction prices will head in future. When the number of investments reaches a certain level, the market becomes saturated and the trend reverses. Investment decisions are usually based on government news releases, current and projected market positions, sentiment indicators (such as investor confidence in the market), and technical analysis to predict prices and the future direction of a trend. Which is not to say, that with enough investors on board, a market trend can sustain itself for years. 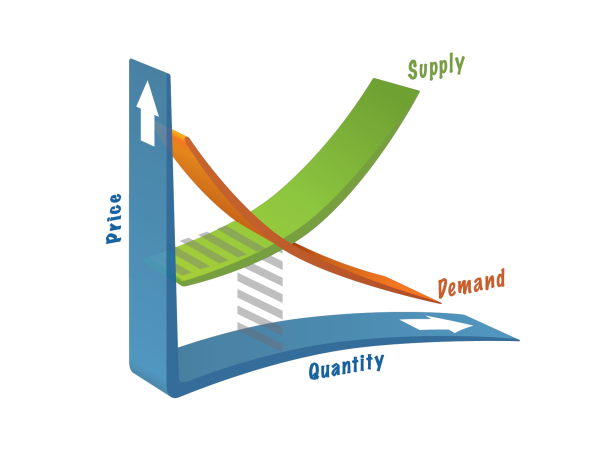 The demand and supply dynamics, as we all know, regulate market prices. This, of course, is when the government does not intervene. When the demand for anything is higher than the supply, prices start to rise. Similarly, any increase in supply over existing demand causes prices to fall. Of course, with stable supply, the prices are only influenced by demand increase or decrease. The four indicators given here are usually the ones responsible for a broad spectrum of trends. When viewed as a continuous chain of cause and effect, one can easily see that government policy decides international exchange of goods and services, which in turn drives speculation and investment and finally demand and supply takes over the price dynamics. Any significant change in any of these factors has far reaching effects on the trends occurring in a market.